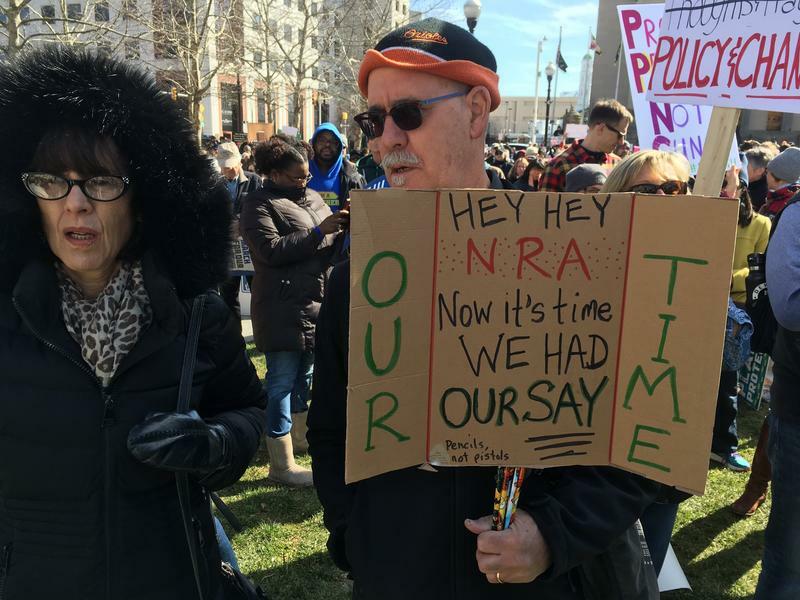 Hundreds of thousands of demonstrators from throughout the nation gathered in Washington Saturday and in cities across the country to demand stricter gun control laws. 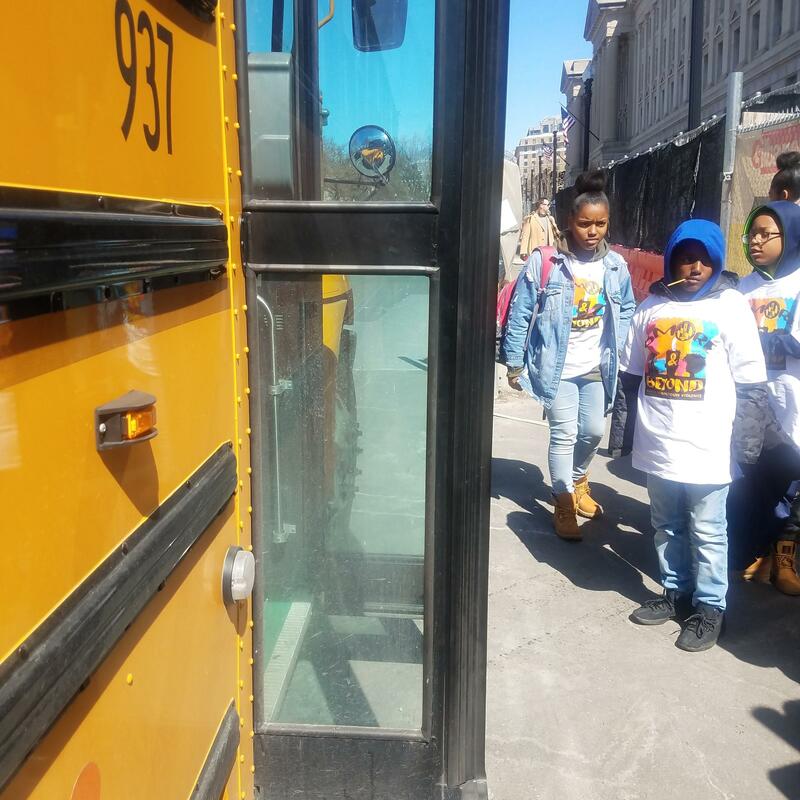 Within that crowd were some 3,000 students, parents and community members, from Baltimore, who rode school buses, paid for with private donations raised by Mayor Catherine Pugh, to the nation’s capital. Some 50 demonstrators met at the Patterson Park Recreation Center early Saturday, one of eight pick-up points in the city, to board the buses for Washington. One 15-year-old student from Coppin Academy, whom we can identify only as Elijah, said gun violence was an everyday occurrence for him. There were a record 343 homicides in Baltimore in 2017, making it the deadliest city in America per capita. And most of them could be attributed to gun violence. Some students compared the message of the march to the Black Lives Matter movement. One girl, who wouldn’t give her name, said she stood in solidarity with the students at Marjory Stoneman Douglas High in Parkland, Florida, scene of the mass shooting that sparked the march, because they realized the voices of students in places like Baltimore have been silenced. Nate Bender brought his 11-year-old daughter, Sophi, to ride the bus to Washington. Bender said he encouraged Sophi to march because he wanted her to have the experience. The Baltimore demonstrators joined the rally on Pennsylvania Avenue, right in front of the Trump International Hotel. Jason Vega, a 12-year-old student from New Era Academy in Brooklyn Park, compared gun violence to cancer. “Now kids are dying from this cancer, and people continue buying guns,” he said. At one point during the rally, the group saw Yolanda King, Martin Luther King’s granddaughter on a giant screen projecting speakers. 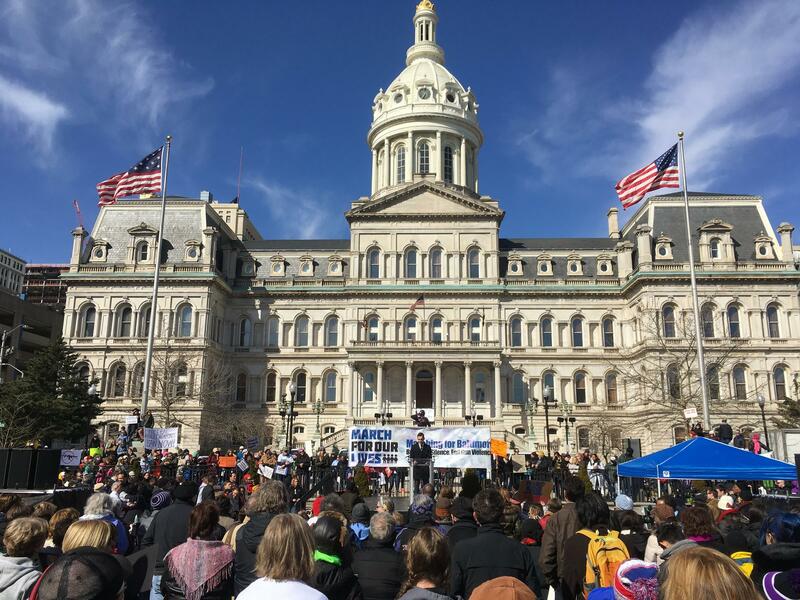 The crowd in Baltimore wasn’t as massive as that in Washington, but demonstrators packed War Memorial Plaza at city hall, chanting and demanding action from lawmakers and their fellow citizens to confront gun violence in schools in particular and the city in general. They waved signs that carried hashtags “#Enough Is Enough” and “#Never Again” and blasted the National Rifle Association for having too big a voice in the gun debate. One of the demonstrators, 14-year-old Faith Murdoch, said she would have gone to Washington, but the friend who was going to give her a ride canceled. So she opted for the local demonstration. Faith said she decided to march after officials at her school, Ridgely Middle in Lutherville, forbade student walkouts March 14, one month after the shooting that took 17 lives at Marjory Stoneman Douglas High School in Parkland, Florida. She said she walked out anyway. Even little kids had something to say. There was Henry and his sister, Ruby, fifth and fourth graders at the Friends School in Baltimore, whose dad wouldn't let us use their last name. Nadira Young, a Roland Park Elementary Middle School language arts teacher, tied the issue of guns to social justice as well. “We stand here today to say never again, not in our schools, not in our homes, not on the streets of Baltimore city and not on the hands of the police,” she told the crowd. Others criticized lawmakers for taking tens of thousands of dollars in campaign donations from the NRA, including Maryland Congressman Andy Harris. “While nearly a quarter of Baltimore City residents live below the poverty line, Representative Harris was given more than what a family of three living below the poverty line makes in a year,” said Juno Ada Conway Owings, a freshman at Baltimore Polytechnic Institute. At one point, organizers invited elected officials and candidates onstage to pledge to work to enact strict gun control measures. “I absolutely, damn well pledge,” shouted Delegate Luke Clippinger, chair of the House Democratic caucus. Afterward, the demonstrators marched south, along the Inner Harbor promenade to Key Highway before disbanding. 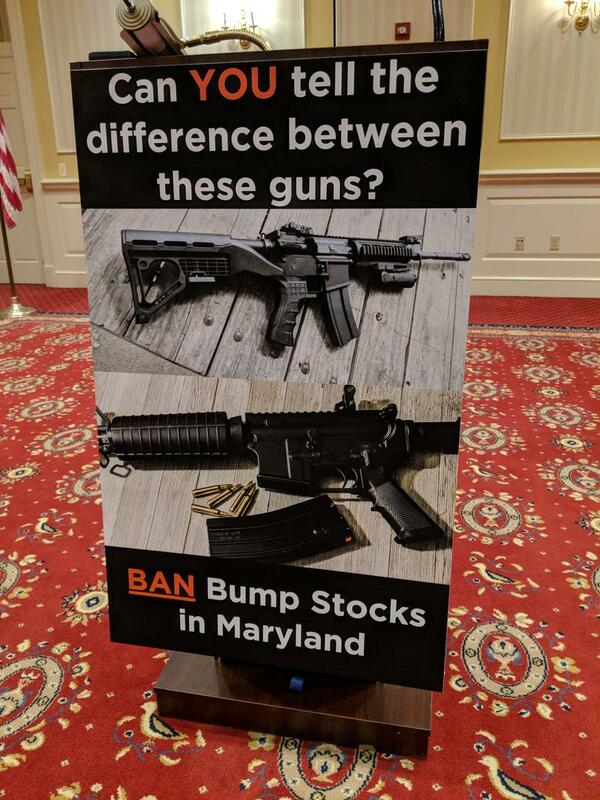 In a largely bipartisan move, the Maryland House of Delegates voted Thursday night to ban bump stocks, the device used in the Las Vegas shooting last October to make a semi-automatic rifle fire rapidly like an automatic weapon. 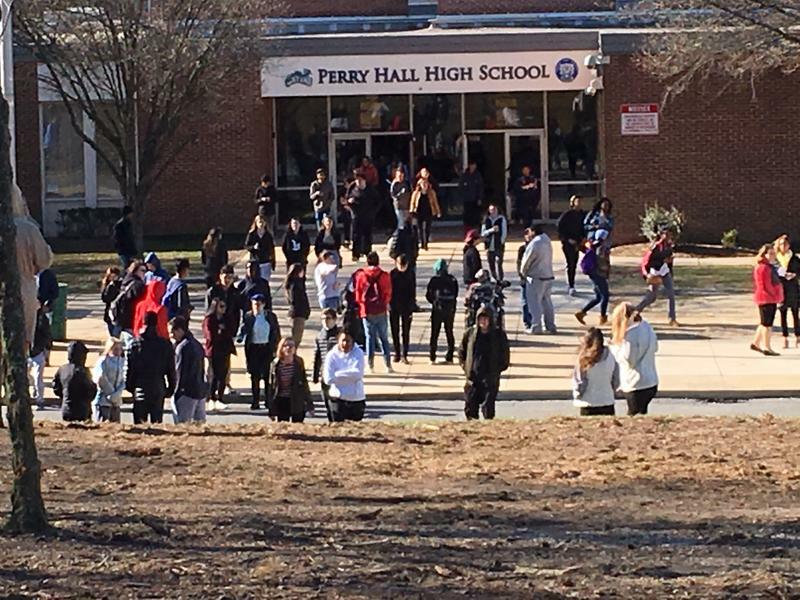 Students walked out Wednesday at thousands of schools across the country, including Perry Hall High School in Baltimore County. They were demanding action on gun violence. Perry Hall High is in Congressman Andy Harris’s district, and the incumbent congressman is being challenged on his record of being a strong supporter of gun rights. 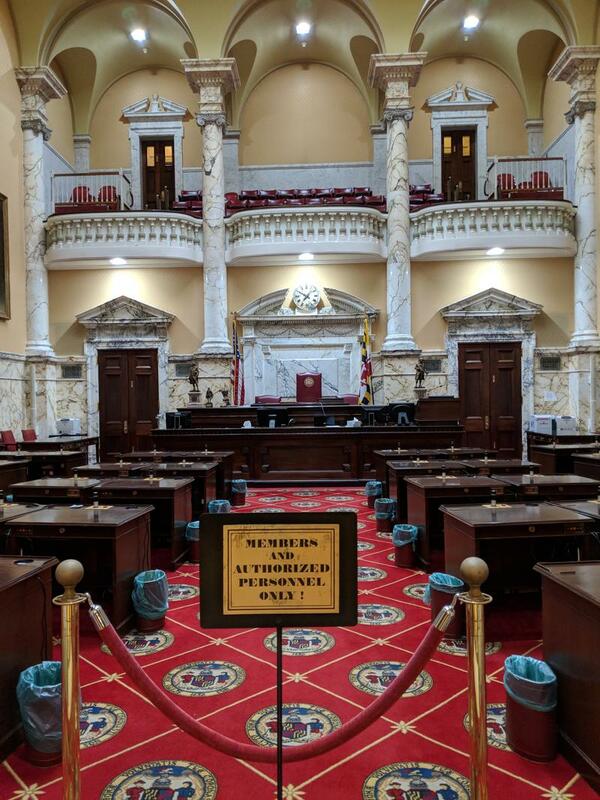 In the wake of the shooting at an elementary school in Newtown, Connecticut a little more than five years ago, Maryland passed a law banning “assault weapons” and large-capacity, detachable magazines. The ban includes a long list of semi-automatic handguns and rifles, including AR-15-style rifles, like those used in several mass shootings, including last month’s school shooting in Parkland, Florida. 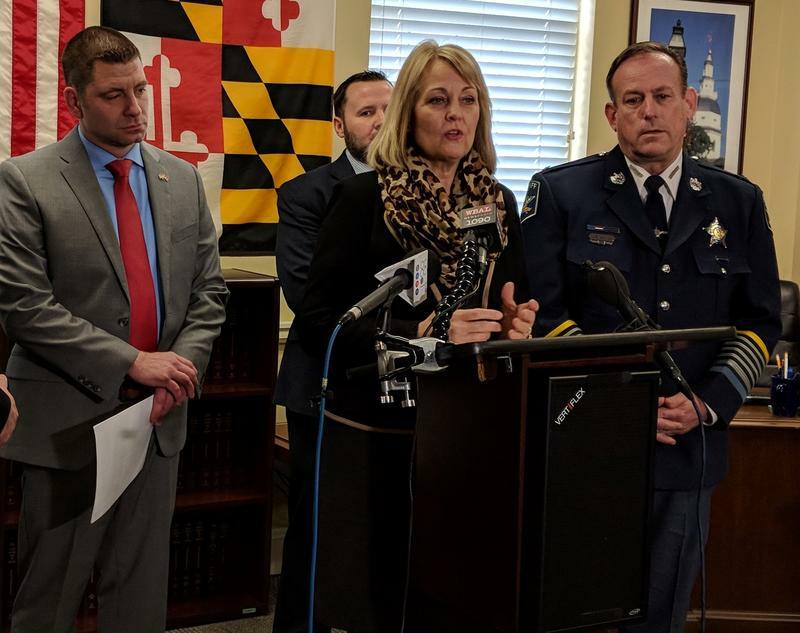 Now Republican lawmakers in Annapolis are sponsoring a bill to remove the rifles and other long guns from the ban. It’s legal in Maryland to carry a concealed weapon on private property, with or without a concealed-carry permit, as long as the property owner approves. Legislation under consideration in Annapolis would extend that concept to religious institutions. State elected officials are proposing competing tactics to keep Maryland’s public schools safe from a possible gunman. Speaking with reporters after Thursday's floor session, Senate President Mike Miller said he met with senators that morning about creating a "comprehensive" package of bills aimed at protecting schools. He promised at least four bills, including some boosting school social workers and placing armed security guards at schools.